With thousands of gallons of flammable liquid and petroleum products stored and sold across the South, Walthall Oil Company turned to Macon’s Infinity Network Solutions to provide local IT expertise, disaster recovery planning and management of its entire core infrastructure. Fueling towards future expansion, Walthall Oil Company is well positioned to grow, all business data is safe and employees remain efficient and confident in their IT systems. Technology has changed a lot since 1952 – the year Walthall Oil Company was founded – and, yet, the company continues to set the standard in the petroleum market. With over 130 employees, technology plays an increasingly important role in the wholesale distribution and retail petroleum industry. Walthall Oil Company operates ten convenience store locations in and around the middle Georgia area. When users started to experience “technology headaches” and frustration started to rise, it was time to look to the future. Servers becoming non-responsive and access to key company data being interrupted when technology reached capacity was a sign that Walthall Oil Company needed a change in the way they handled their business data. Vice President of Information Technology Malcolm Walthall was already stretched to capacity and the time was now to make some technology changes and regain confidence across the organization with their IT systems. Walthall Oil Company uses two main applications to run their wholesale and retail side of their business. DM2, which is a tailored version of Sage’s MAS200 Accounting platform and Pinnacle which is used to run the retail side of the business. These core applications are essential to tracking sales information, inventory levels and improving store operations. Leveraging a combination of physical and virtual server technologies, many applications have been migrated over to the Walthall virtual server environment; however some legacy solutions still have a requirement for a physical server, one of these legacy solution uses a Brooktrout Fax card to provide network faxing services. Walthall uses Microsoft Server technologies to power their back office services and Microsoft Windows and Office on user systems. Infinity Network Solutions is active in the Macon business community, and met with Malcolm Walthall through a local organization. When Walthall’s role changed in the business and their internal IT professional left the company, this put Walthall in a crunch. He reached out to Infinity Network Solutions on a recommendation from a colleague who currently works with the IT services provider. Walthall was interested in learning more about the Infinity I-TAP and managed IT services program, a model that seemed to fit perfectly for what Walthall was looking for. Concerned about having to invest a lot of money to upgrade the infrastructure, the I-TAP program provided a solution that allowed Walthall to finance their technology. This solution saved them from a major cash outlay and achieved their immediate goal of having the server environment stable and reliable, keeping any major disaster from crippling their business. Infinity Network Solutions provided Walthall Oil with a complete network assessment and recommendations to meet Walthall’s immediate needs as well as providing a technology plan for the future. Infinity Network Solutions recommended a consolidated virtual server environment consisting of two Cisco C Series servers and an EMC storage appliance to replace their seven physical Dell and HP servers that were currently in use. The virtual server configuration allows for all applications and responsibilities of the existing individual servers to be performed on fewer physical machines. The two Cisco C Series servers provide a “load balance” solution for the virtual server instances providing automated failover in the event issues arise, taking the virtual instance offline (or the entire server offline). This technique provides more up-time and reduces user interruption. An EMC VNX-e 3100 series storage appliance provides application and user data in a single location. This method allows for easy scalability as data growth occurs. Future server needs can be accomplished by adding an additional server “instance” while keeping the existing hardware. This ability allows the company to adapt new applications with minimal hardware/software costs and implementation time. Cooling and power consumption costs are reduced since fewer physical servers are running in the data closet. Walthall Oil has sales professionals and executives who use mobile solutions. Infinity Network Solutions deployed Citrix XenDesktop Platinum Edition, replacing the Citrix Presentation Server which was used to share access to the company’s DM2 application for remote users. The Citrix XenDesktop solution allowed for faster printing through Crystal Reports, easier management of the remote users and a secure remote access solution to company information. Included in the Walthall Oil project was a robust Business Continuity and Disaster Recovery solution using EMC, replacing the previous backup solution from Iron Mountain Autonomy LiveVault. The Iron Mountain solution offered no real disaster recovery and the risks to Walthall Oil’s business from a disaster occurring is large. Data was previously backed up with Iron Mountain and safe; however if an event occurred that required that data, business would have come to a near stand-still until the recovery was complete. Infinity’s EMC solution provides a replicated SAN deployed at a remote Walthall office outside of the Macon area. Data is automatically replicated to the remote location. If the local EMC VNX-e fails, all Walthall Oil servers will automatically switch over to the remote unit until the local appliance is brought back online. Included in the disaster recovery plan is full bare-metal versions of the server architecture that can be restored rapidly in the event they are required. During the deployment of all the new technology, Walthall Oil prepared for a full day of downtime. This downtime never materialized and Infinity performed the entire migration without any user interruption. Infinity Network Solutions’ I-TAP program provides full management of Walthall Oil’s server environment, saving Walthall the challenges associated with having to hire a new IT professional. 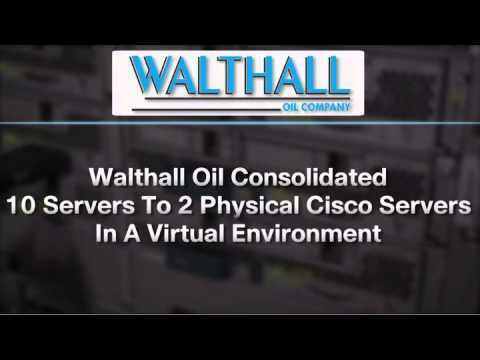 Walthall Oil continues to trust Infinity Network Solutions to help guide them with all major technology initiatives. New technologies on the roadmap include a new telephone system and assisting with expansion into the Florida market.